Parenting. For those childless DINKs looking in, it can seem like a stream of candy, staying at home, and fun DIY activities. But for those of us stationed in the trenches day after day, we know what a battle it can be. 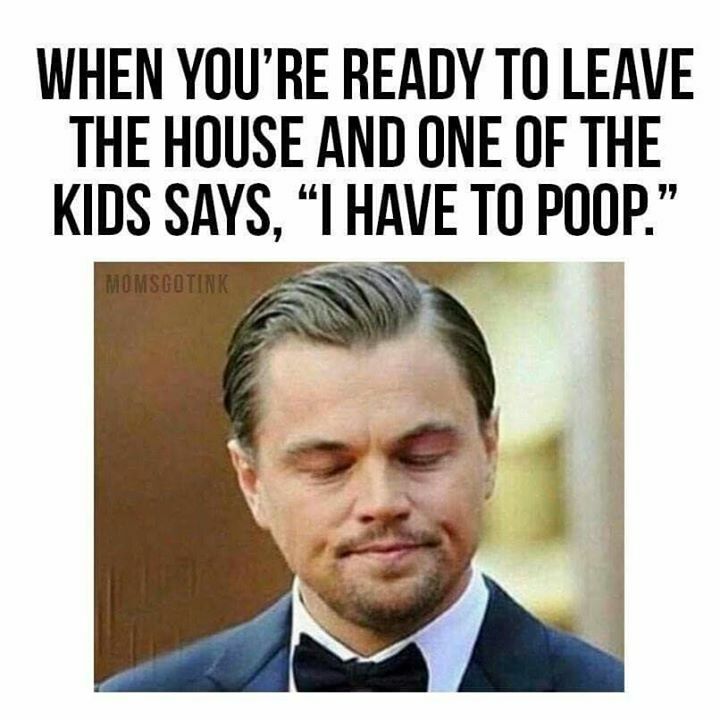 So whether you’re zoning out at work or taking a breather in the bathroom while your kid pounds on the door to get in, here are some of the best parenting memes – because laughter makes it hurt less. Sorry, kid. The sound had to go because daddy couldn’t handle the same sound 15356 tims in a row. 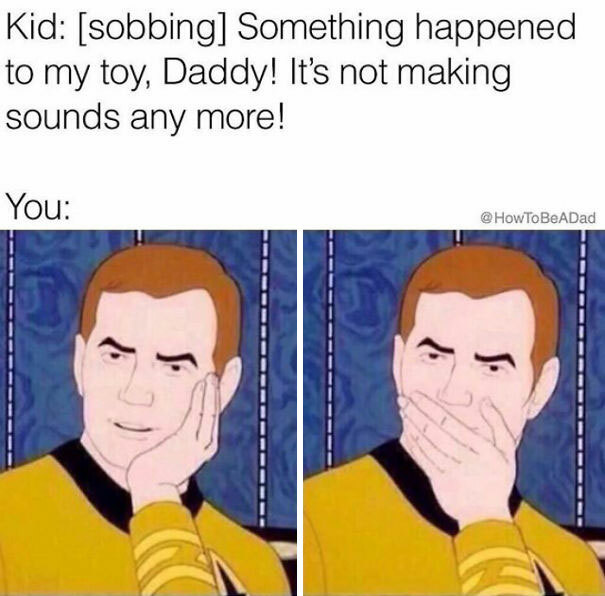 At least parenthood gives us that faux shocked face down, right? 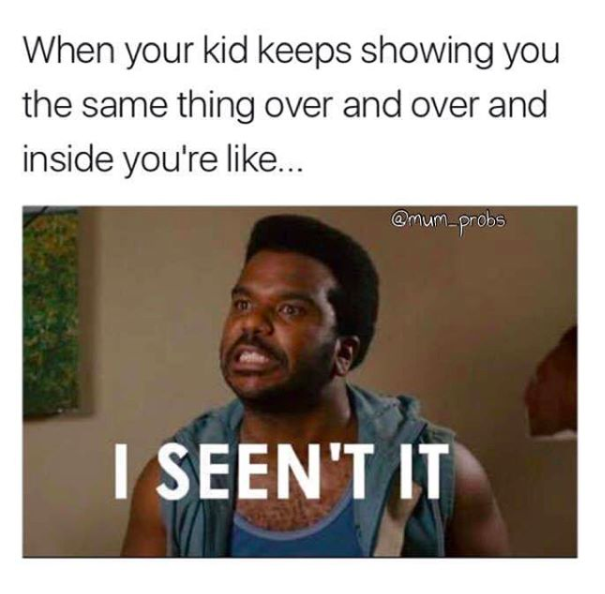 After the first year of parenthood, we’ve about seen it all. By the end we’re all naming our wine glasses “Wilson” and screaming when they’re gone, aren’t we? 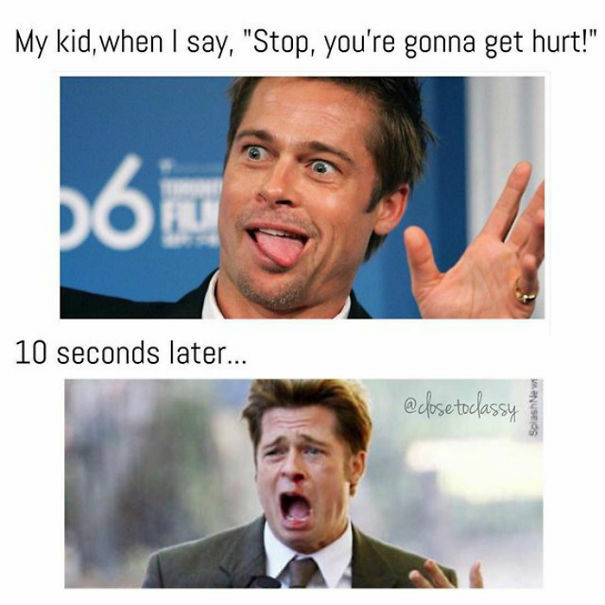 Kids only want to be warned so many times. And ultimately, they’ve got to make their own mistakes to learn anything. My biggest thing is that I’m the one that’s going to have to clean that knee. I swear, it’s like they want absolutely zero to do with you when you’re warning them to not do something dangerous, but when you’re trying to get a little shut eye they just want to…watch. At the end of the day, I may want a morning to stretch out child free, but the list of people I trust with my kids lives is so small, I should get out a magnifying glass. 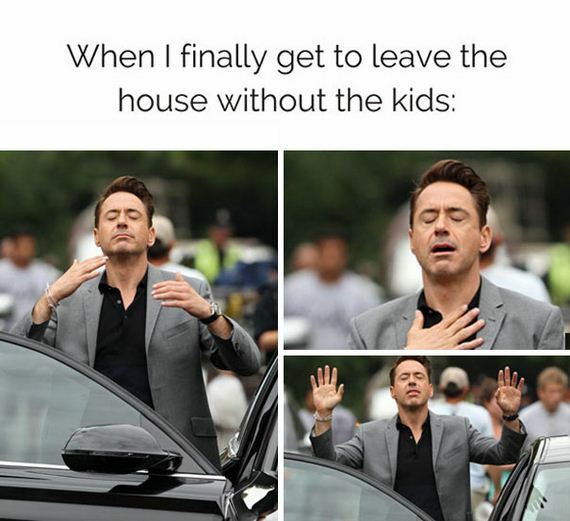 But when I finally find that person to watch the kids – it’s like a pure slice of heaven. The air smells sweeter. Maybe it’s the lack of stinky diapers or smelly shoes. This. 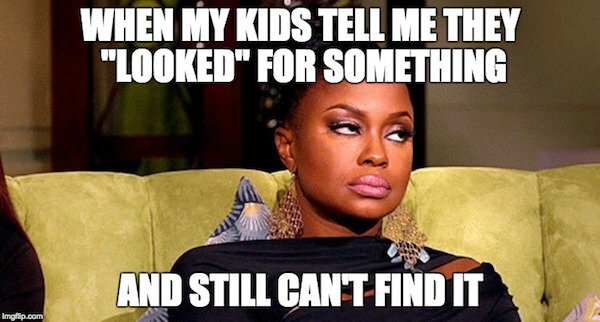 Why do kids have the worst eyeballs when it comes to looking for things they need, but they can always seem to find mommy and daddy’s secret candy stash? 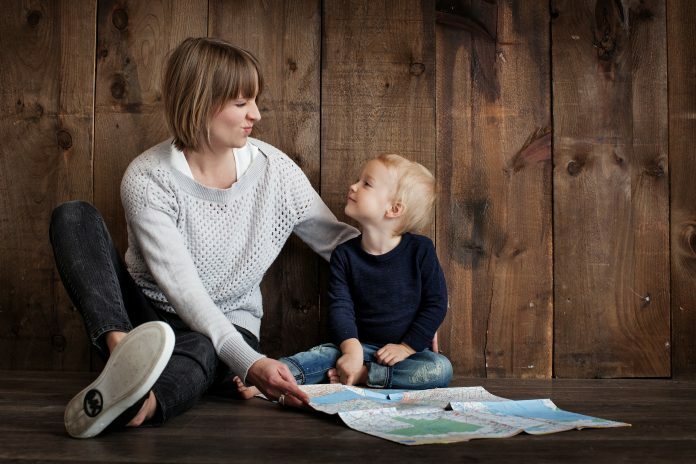 If they looked for our secret goodies hoarded from their old Halloween candy half as hard as they looked for their shoes, mornings would be much easier. Because let’s face it, each morning we start out so optimistic. But fifteen minutes later and they still can’t “find” their shoes? It’s time to unleash the scary Batman mom. To be honest, sometimes it doesn’t even take until the end of the day. By the end of the car ride to school, I feel chaotic enough to get into full Cruella mode for the rest of the day. Oh, we were so naive. Ice cream and happiness on a merry-go-round while the kids sing beautifully? More like they’ve ganged up against you and are figuring out the best way to tear you to pieces. Sometimes there’s nothing that can rattle a perfectly good day. Even if your kids are shrieking like raptors in the back seat. 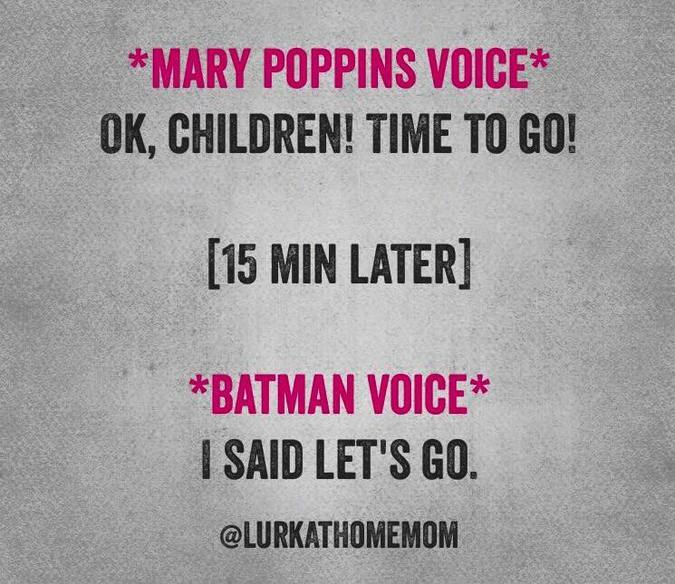 Thank goodness for parent ears, where you can filter out all the shrieking in a 100-yard radius. We’ve all been there, lady. You’re doing great. Just ignore the dirty looks from everyone else! Not many things test my patience, but wrangling a child into a snowsuit is its own special hell. And doing it twice in a ten-minute span? Nope. No thank you. No way. Oh, hell no. 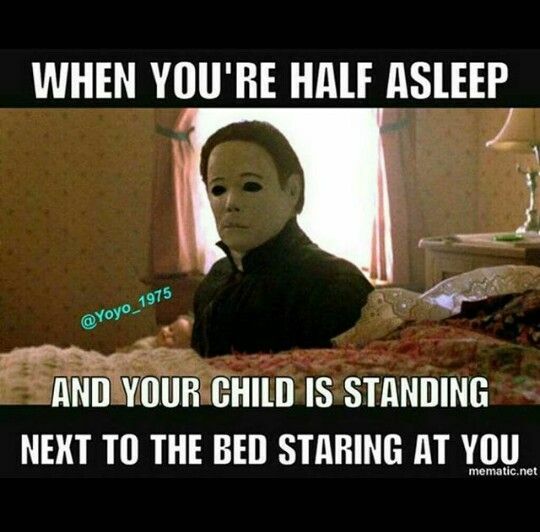 Sometimes childrearing is a little too similar to the most terrifying scenes out of “Paranormal Activity.” And even though I’m a little curious about how long she stands there, you know there’s no way I’m setting up home video cameras to find out. It’s like we’re suffering from all the exhaustion of an epic journey, but with no ring that makes us invisible so we can hide from our kids. Because – yep – there’s nowhere to hide. 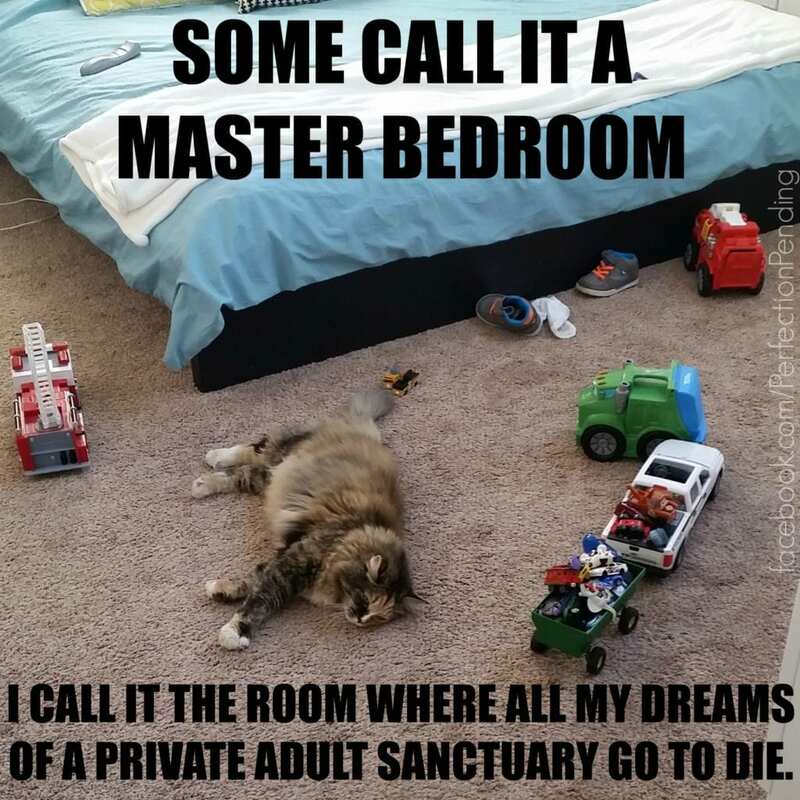 Not even our bedrooms. And absolutely no hiding in the bathroom. They will find you. They will get you. And that’s before they even see the dragon in me come out. What kind of childless animal decided to make pajamas that are so hard to get into? Who? Because two can play that game. 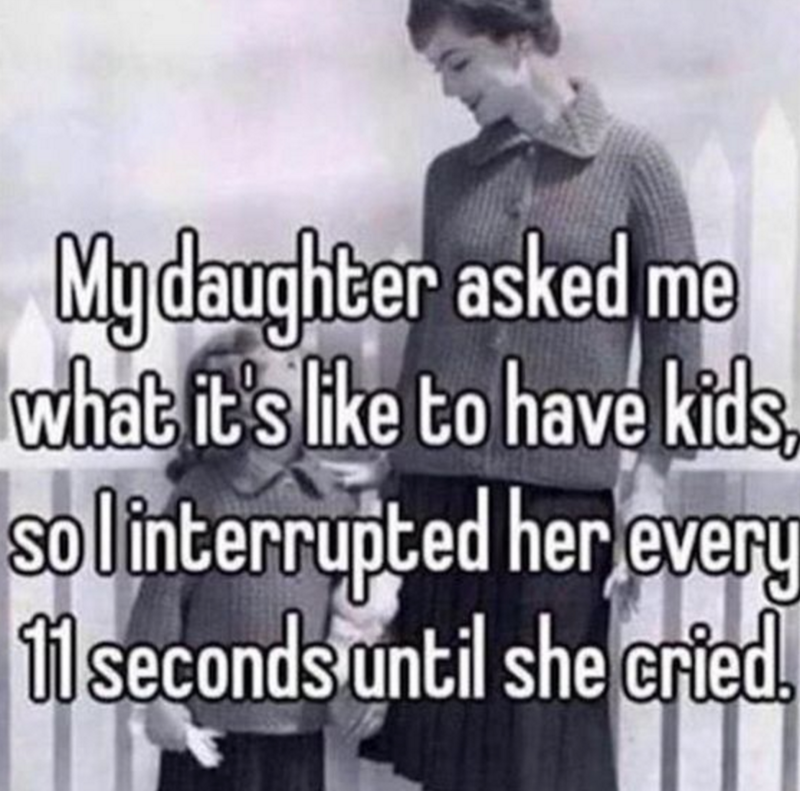 Maybe now she’ll only interrupt every 22 seconds – I guess parents will take what we can get. I can only pretend to be excited so many times. 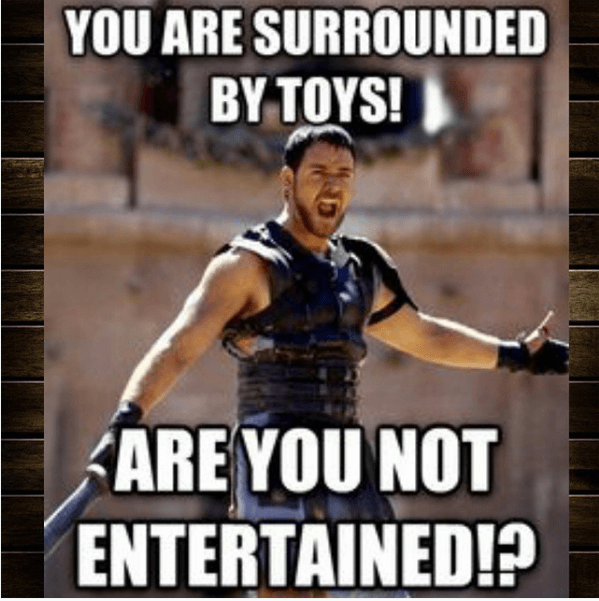 And when you cave and buy them a new toy, they’re only interested for what, a day? Then it’s back to playing with the box. So close to being on time. So close. Is there no end? We’ve done it all, we’re so close, and then – “Mom?” from down the hall. Dear God. At the end of the day, moms just don’t get a break. Even to poop. 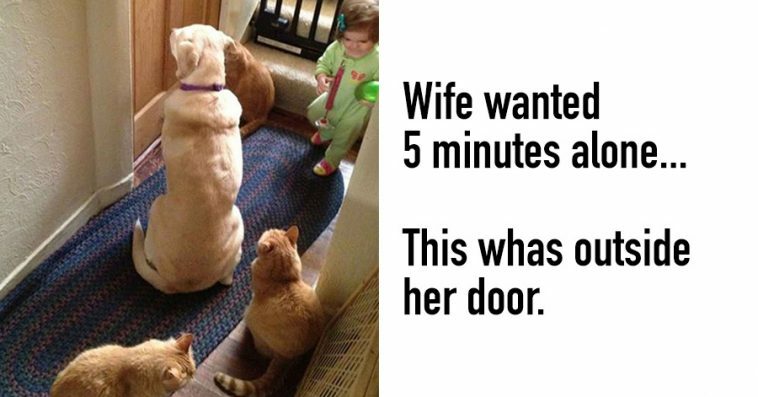 Between fur babies and human ones, someone always needs you.